I don’t know when webmaster Oliver put this up, so you may have caught it before I did. But part 1 of my series on turning a $10,000 house into a home is now online at BHM. Working on part 2 as we speak. I am seriously in awe of your work ethic. I’d not only have declined to buy the house, I’d have declined to get seriously involved in helping you rehab it. Can’t believe you’ve come this far so quickly. ML — No, your eyes don’t deceive you. There’s no way to get in the front door other than climbing up the wall. A small deck is in the plans for next summer (but then, it was also in the plans for this summer, so we’ll see how it goes). I’ve considered building a set of temporary steps, but since only Mormon missionaries, Jehovah’s Witnesses, and Seventh-Day Adventist recruiters use the front door, I’m not sure it’s worth it. The back porch, which everybody else uses, consists only of a piece of rotting siding and a pair of large wood blocks, but at least it exists. That’s a 2016 project, too. Oh, and thanks for the compliment on the colors. I must have gone through 100 paint samples before I finally came up with that five-color combo. LOL, Joel — Worry not. I’d have never, ever asked a friend to commit in any major way to this project. My friends are too few and too precious to lose. The colors really are great. Did you know the secret, http://www.amazon.com/Color-Me-Beautiful-Carole-Jackson/dp/0345345886/ref=sr_1_1?s=books&ie=UTF8&qid=1441030409&sr=1-1&keywords=color+me+beautiful or did you go on instinct? LOL, Shel. That reminds me of the days when all us females were “having our colors done” and discussing whether we were Autumns or Springs. Me? Instinct, a little inspiration from a few local Victorian “painted ladies,” and learning about the color wheel from my wonderful high school art teacher. To my eye, I still haven’t got it quite right, but I’m not going to do it all over again. Just so you know, you’ve inspired me to take a closer look at some fixer-uppers in my area. Not sure I’ll ever get one, but it’s a possibility where before it wasn’t. Wow, OK I am certainly impressed. I would never have been a part of a project like this because of the volume of work required. Good on you for taking this on and good on you for seeing it through. I just hope that when you’re all finished you don’t get taxed out of it when the town assess the value of the improvements. I’m even more impressed after reading the BHM posting. Honest. Especially since I don’t know s*** about houses, or at least as little as possible. I really think Carole Jackson’s system works. You’ve got Spring colors for the door, door jamb, nearby facing, walls, and borders of the windows, which wonderfully separate the windows themselves from the walls and prevent a horrific clash. The dark green contrasts nicely with the Spring colors and effectively balances the dark roof, which is dark enough to be neutral. Virtually no project of any sort is perfect in the maker’s eyes in retrospect, so if you “haven’t got it quite right,” it’s a smashing success. Re your previous roof and ladder escapade: Courage is the ability to push through fear; by definition, you showed it. Pat on back. Wow. I’m certainly impressed. That’s the sort of project I sometimes think I might want to take on, but not on a shoestring, and not while attempting to live there. Yes, I know, you didn’t move in straight off. I would’ve waited a lot longer. What an amazing job you’ve done, Claire! When we built our house in the forest, we lived in the construction for 2 years, which was challenging enough. I can’t imagine living thru de-construction and construction. Nice job Claire – it’s completely unrecognizable from what it was before. 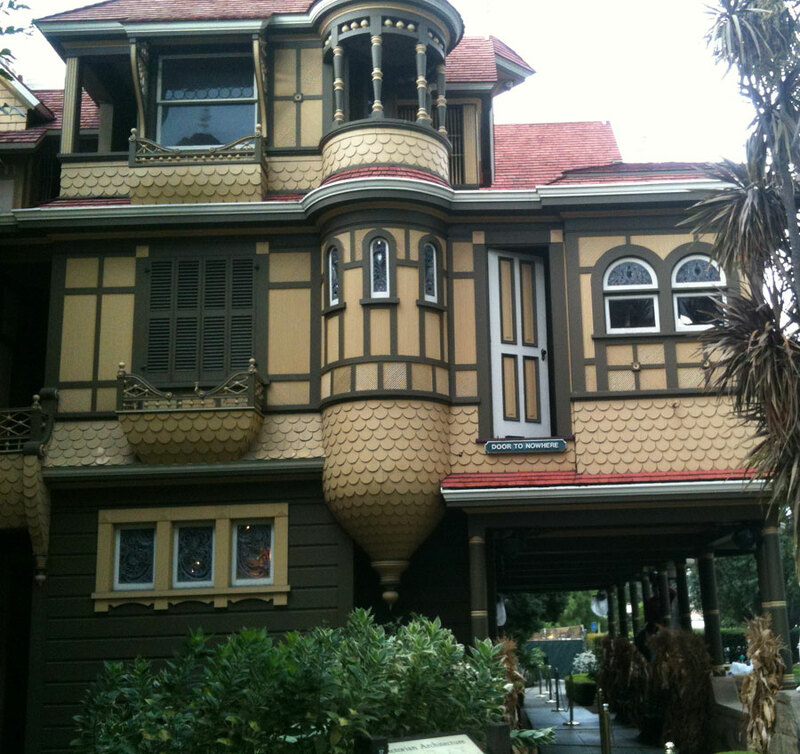 I toured the Winchester Mystery House once when I was a kid and it was an awful, unrestored dump. I’d love to see it again now that it’s been given some love. Congrats, CW, but all I can think of when I see this is “how much are your property taxes gonna be when you’re done?” I guess I’m truly a jaded homeowner if that’s the first thing that comes to mind! You are demonstrating that anything’s possible with enough hard work–and an eye for color, for sure. Inspiring, beautiful, and (I read the article) such an incredible change! Congratulations on phase I.
OK, but where’s the next installment? Laird — I’m typing as fast as I can! I might have to hold a fundraiser, first!